Wondering how some of the Indian women have become successful entrepreneurs? Want to know the traits of such inspirational women? 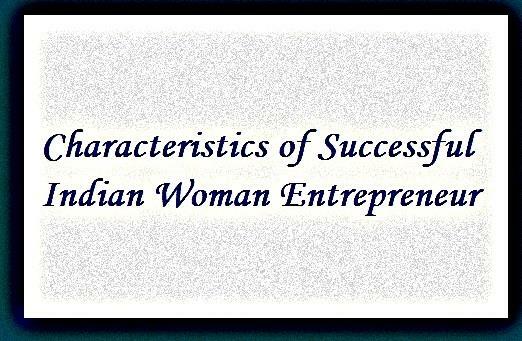 Read on the article to know the characteristics of successful Indian woman entrepreneur. With the ever-increasing awareness on women empowerment, there is a gradual increase in the Indian homemakers who are becoming entrepreneurs. The web-dominated world has become a boon for the homemakers who are productively using their free time and could make decent earnings without getting out of their homes. Some of them are self-satisfied with whatever they achieve while there are few who yearn to become successful in their chosen field. Woman in general and women entrepreneurs in particular play a major role in the economical development of the nation. Courage is one of the most important characteristics of an woman entrepreneur. They many have the passion to start their own business, it's the courageous ones who succeeds in their career. A disturbed mind of the woman acts as a hindrance and she cannot achieve success in her venture. There could be exceptional cases where such women could succeed in their chosen field, of course, with great difficulty by crossing all the hurdles of life. A successful woman remained balanced and stays calm under all circumstances and has a sound mind. She do not gets disturbed or panicky for small setbacks in her ventures. A woman with a sound mind has the ability to take the right decision which helps her to succeed in her business. She has the ability to visualize the requirements of the society and is clear about the requirements of the society. A successful woman always thinks out of the box to provide what is required in the most satisfying way. This helps in achieving further success. She has a clear vision which forms the basis for a successful career life, of course personal life too. Self-confidence is one of the most important characteristics for a successful life. A confident woman has tremendous faith in herself and her abilities. She can easily resist the changes in the consumer market and succeed in her business. A woman who is bold has the inner strength to face and cross the hurdles of life, if any, with an open mind. Most of the successful business women set targeted goals in spite of their family responsibilities. They work hard for achieving their set goal/s. Women who are goal oriented, work harder and succeed in her business. A majority of successful women entrepreneurs have an optimistic approach. She is capable of transforming her ideas into reality through her optimistic approach. They work hard with the hope of success and do not give room to fear of failure in their mind. They remain strong and determined during adverse situations and try to come out of it. Hard work is one of the greatest abilities of a successful woman entrepreneur. She willingly works hard for achieving her goals. She takes up every work with a challenging mind and with an orientation to achieve success. She doesn't take up work for the sake of doing it or just for earning few bucks. She is capable of confidently taking risks and is efficient in making the risk, a rewarding one. A successful woman entrepreneur takes various decisions on various activities of her enterprise with assertiveness. She takes firm decisions on the type of venture she undertakes and the way of doing / handling it. She is clear, creative and assertive in her decision making. She can efficiently cope up with the stress levels in a better way by spending value time with her children, spouse and family members. She very well knows how to balance her work-life which is one of the keys to successful business. She makes time to spend with her children and supports them in every possible way without any excuses of busy work life. One of the most prominent characteristics of a successful woman entrepreneur is she is keen on meeting new people and thus tries to grow her business contacts. She readily socializes with people whom she thinks are useful in developing her business. She will never miss the social events / gatherings and she is keen on increasing her circle. She is a good relationship builder and develops mutually beneficial relationship in the society. Good organizing skills and managerial skills are the important traits of a woman entrepreneur. She is competent in developing / building a good organization. She efficiently co-ordinates with her employees and effectively manages the finances / capital. To expand her business and achieve her targeted goals, she occasionally organizes minor events like sales and exhibitions etc. A successful woman entrepreneur exhibits high leadership qualities. She is capable of influencing her employees and creates an enthusiastic work environment for them. She supports them in all possible ways and encourages for a good team work to achieve targeted goals. A successful business woman is mostly profit-oriented and focuses / works for her business growth. A woman with a passion for becoming an entrepreneur should try to develop the above mentioned traits, cross the hurdles with a determined mind and she is sure to have a successful tomorrow.